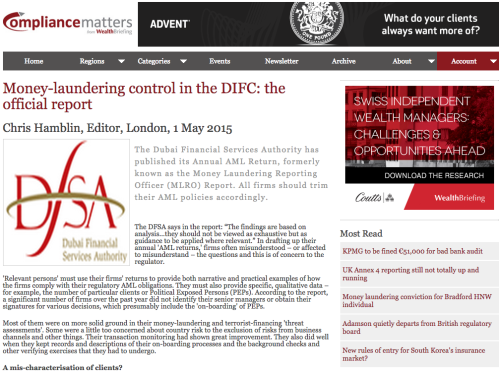 Compliance Matters is the key source of international news and analysis on the latest regulatory initiatives within the private banking and wealth management industry. Failure to understand and adhere to current financial regulation and laws carries severe penalties in the form of imprisonment and large-scale fines. Therefore, the gravity of non-compliance cannot be underestimated by compliance professionals and the C-level executives who hold ultimate responsibility. Compliance Matters provides readers with exclusive access to expert analysis and advice on how best to operate a business within the legal bounds. With breaking news and in-depth features explaining the complexities of regulation, this essential resource provides the reader with detailed copy available nowhere else.